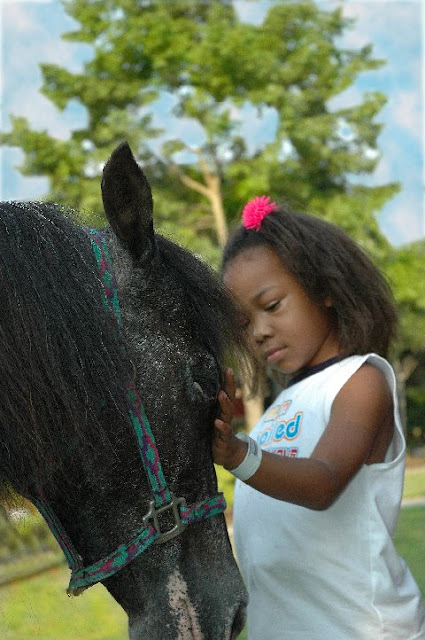 MOLLY THE PONY BOOK UPDATE: Ten years after Hurricane Katrina hit New Orleans, Molly continues to be in great health. Meet Molly. She’s a gray-speckled pony who was left behind by her owners when Katrina hit southern Louisiana. She spent weeks on her own before finally being rescued and taken to a farm where abandoned animals were being cared for. While there, she was attacked by a rescued pit bull terrier, and almost died. Molly's gnawed right front leg became badly infected and her vet went to the equine hospital at Louisiana State University (LSU) for help. But LSU was overwhelmed, and this pony was an equine refugee. No American Express card dangled from her frayed halter. If you've ever had an animal in need of major surgery, you know what the criteria is. But after the local veterinarian persisted, LSU surgeon Rustin Moore agreed to meet Molly face to face, and that meeting changed his mind. He saw how the pony was careful to lie down on different sides so she didn't seem to get sores, and how she allowed people to handle her raw, infected limb. When she stood up, she protected her injured leg. She constantly shifted her weight, and didn’t overload her good leg. She was a smart pony with a serious survival ethic. Dr. Moore agreed to remove her leg below the knee in a very special surgical procedure and a temporary artificial limb was built. The Humane Society of the United States and Lifesavers Inc. (an animal-angel arm of Lifesavers Wild Horse Rescue in California) provided the funds for the operation. Molly walked out of the clinic and her story really begins there. Here's Molly having a clean sock put over the stump of her leg before the leather sleeve of her prosthesis is strapped on. The other important factor, according to Moore, is having a truly committed and compliant owner who is dedicated to providing the daily care required over the lifetime of the horse. 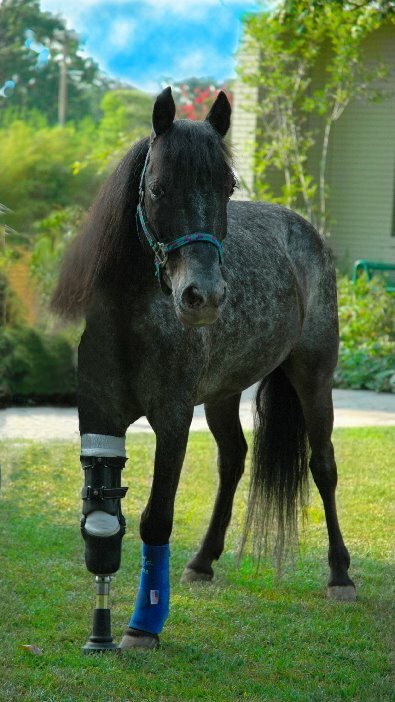 For the rest of her life, Molly will be at risk for the terrible disease called laminitis, which often affects horses who bear unequal weight on their legs and makes amputation a controversial option for many horses. But expert care has kept Molly free of laminitis. Molly’s story has turned into a parable for life in post-Katrina Louisiana. The little pony gained weight, her mane felt a comb. A human prosthesis designer built her a leg. “The prosthetic has given Molly a whole new life,” Allison Barca DVM, Molly's regular vet, reports. “And she asks for it! She will put her little limb out, and come to you and let you know that she wants you to put it on. Sometimes she wants you to take it off too." And sometimes, Molly gets away from Barca. “It can be pretty bad when you can't catch a three-legged horse,” she laughs. Most important of all, Molly has a job now. Kaye, the shelter farm owner, started taking Molly to shelters, hospitals, nursing homes and rehabilitation centers--anywhere she thought that people needed hope after losing so much in the storm. Wherever Molly went, she showed people her pluck. She inspired people. And she had a good time doing it. This month, Molly the Pony, a children’s book about the pony who has already inspired thousands of people around New Orleans, has been published. It’s not a book about amputation or prosthetics, it’s a book about people and a pony. But the photos you see here are a few of the great ones from the book. Maybe Molly won’t make the vet textbooks, but she might reach more people from the pages of this book for children. If you know a child, a library, a hospital, or maybe a therapeutic riding program that can use a lift, here’s a book that can do that. And a lot more. The book Molly the Pony has been awarded the 2008 Henry Bergh Award from the American Society for the Prevention of Cruelty to Animals for children's books about animals. Molly the Pony is no longer available from Hoofcare Publishing. 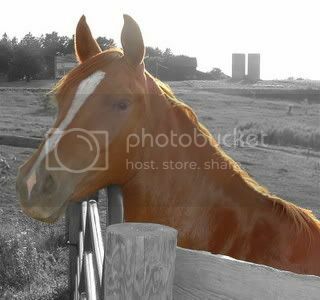 We prefer that you order it directly from www.mollythepony.com so that the proceeds can go to help pay her vet bills. You will LOVE this book--and Molly! PS Many, many thanks to all the people who are forwarding the link to this story around the web--and around the world. This has been the most popular story ever posted on this blog, and deservedly so. Interesting to note: almost everyone who has called was ordering as a gift for a child with some sort of a hurdle to overcome. It is the perfect gift for that...and I am so moved by the stories that callers have told me. Thank you, everyone. This is truly a "grassroots" effort since neither the university nor I has the funds to properly promote Molly and her story. She's an underground classic! To forward this blog article, just click on the little envelope icon at the end of this story, if there is one, or copy and paste the address from the browser window. All HoofBlog text and images © Hoofcare Publishing 2008 unless otherwise noted. Molly's photos from the book MOLLY THE PONY by Pam Kaster. Most photos of Molly are © Pam Kaster. This mare has the heart of a champion. Thank you for sharing her story. Somebody dear to me recently suffered an amputation and I gather that will find this story inspirational. Thank you for sharing. Inspiring, had no idea they could do thing like that for horses. I will be orderign that book for my daughter, she would really like it. Rec'd this blog post as a forward. I learned about Molly on Lifesavers website. I was glad to see this update and learn about her book! WildHearts Out West......this procedure done for MOLLY and the person and person's who picked her up and cared for her has the ulimate heart and spirit for horses!!!!!!!! !NO WORDS can explain their graditude for MOLLY. Just remember it "WAS NOT THE PITBULL" terrier's fault...It was the grusom S.O.B. owner of the dog who should be torchured just like Molly was. I bet the dog's owner has a heart of stone or this event would not have happened. PittBull's are sometimes like a loaded gun and it's the user who is at fault. But the good side??? LOOK AT MOLLY and all others who she is serving now. Molly -- you go girl! fabulous story! Amazing pony and amazing people who saved her. What a wonderful success story in the face of such a tragic time in this country's history. Hopefully it sheds a light that no matter how dire and hopeless a situation may appear-there's always hope. Blessings to all the folks who took the time to make a difference. I just love this heart warming story of success and determination. It is pure inspiration! I am the mother of a 21 month old little girl, who wears a prosthetic leg. She is not a horse, but what an awesome story! I got the picture of Molly emailed to me this morning and it made my heart melt. What an inspiration! Love, love, love Miss Molly! Thanks to those who saw her potential! You are amazing! I was just forwarded this post via email, and it is an amazing story. What an inspiration. Awesome story! Awesome blog. 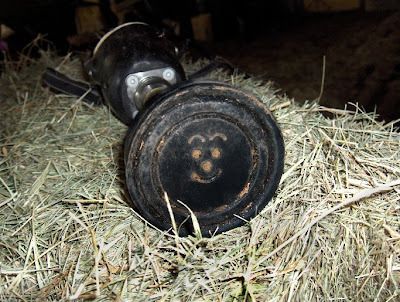 Thanks for all the great articles on horses and hoof care. I'm linking to this story on Molly on my blog tonight! What an uplifting story on many different levels. I've also linked to it under Inspiring Animal Stories on http://squidoo.com/animalspirits. Amazing story! What a great inspiration! This was an awe inspiring story. Molly the Pony is one very special girl. It is a shame that more horses and ponies can't be saved,unfortunately everything hinges on money. Wouldn't it be great if more professionals would donate their expertise to care for these injured animals. That Molly is amazing! Stories like this can give us all hope! OMG...thank you for this story. My daughter lost her pony last year to a tendon injury and I wish that I could have given our precious Patch this kind of opportunity. May all of you be blessed for helping this beautiful creature. An inspiring story, in sharp contrast to the racehorse memorial I operate. Thank you for changing lives, Molly! Words cannot express my sense of gratitude for people like you. When Hurricane Katrina hit, truly my first thoughts were "What about the animals?!" People can fend, speak, demand their needs, but an animal will wait for our help with endless loyalty that they and we so much admire about them.Horses and dogs are my favorite and....(tears of knowing there is Hope answers) God Bless you, Molly and all the others that survived!!!! What an heartwarming story about a remarkable pony. And thanks must be given to the fine veterinary staff and volunteers that gave Molly the chance to survive to become such an inspiration. The only part that really saddens me is to hear that Molly's injuries were caused by a vicious Pitbull. There have been in the past 2 months, two unprovoked attacks on horses while ridden under saddle by Pitbull terriers in my area. When will people learn that these dogs are DANGEROUS and need to be treated as such? I hope that Molly's story will not only continue to lift people's spirits with her zest for life and gentle nature, but also raise awareness of the severe threat that Pitbull dogs poise to innocent people and animals! Yes, this is a truly inspiring story. However, the person who said the owner of the pitbull must have had a "heart of stone" couldn't be more wrong. Both Molly and the pitbull that attacked her were rescued in the wake of Katrina, and therefore were both owned by the same person, Kaye Harris. So I guess you can see how senseless that accusation is now. So let's not use this an excuse to bash either pitbulls or their owners (in other words, keep this positive, as it should be) and instead focus on what a plucky little pony Molly is! I'm proud to say that Molly's vet was also my vet for many years when I lived in Louisiana, and she took as amazing care of my animals as she did of Molly. She is truly an exceptional veterinarian.